Asking a colleague how anyone could encapsulate the exquisite, earthy poetry of Terrence Malick’s cinema in a mere 180 words, he responded: ‘It’s easy! “Blah, blah, magic hour. Blah, blah, voiceover. Blah, blah, the awesome power of nature. Hyperbolic sign off”.’ Fans of the director’s small but perfectly formed oeuvre will know that these are all indeed typical Malick motifs. 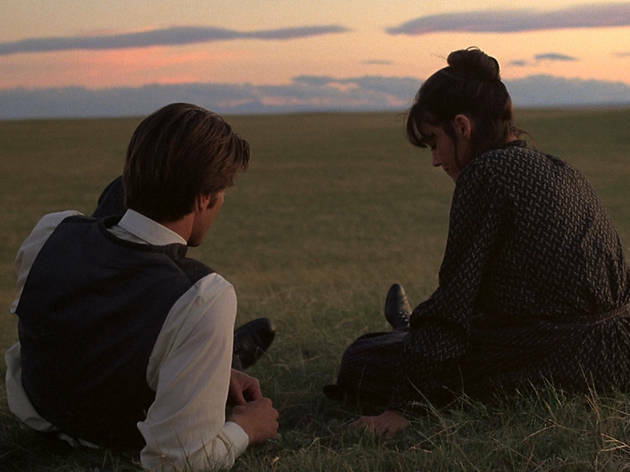 But fans will also know that they were put to their most sublimely sensuous and conveniently approachable use in ‘Days of Heaven’, his peach-hued masterwork from 1978 which opens ahead of the BFI’s full Malick retrospective. Richard Gere and Brooke Adams take time out from life to frolic in the swaying wheatfields of the Texas Panhandle, hawkishly overseen by Sam Shephard’s tragic Jay Gatsby figure who eventually lets his suspicions get the better of him. Theirs is a tale of almost biblical profundity: a furtive love allowed to bloom momentarily in this glowing, golden paradise before commerce, responsibility, law and violence put a heartbreaking end to their innocent bliss. Visually and thematically, it’s still one of the most beautiful films ever made. Typical Malick pretentious, vacuous filmmaking. Terrible script - there wasn't one. Not sure if it's true, but the dialogue was all improvised, and it sounds like it too! I feel sorry for Linda Manz - her career could've taken off if it wasn't for this Malick idiot asking a child to improvise all her lines, rather than actually DIRECTING her (NB: She's always talking about the other girl's ear, because it's the first thing she sees to talk about!). Â The story could've been good, like if the woman had fallen in love with the farmer properly and that's how they ended up, but ultimately it's very basic and predictable - apart from the bizarre inclusion of the flying circus...WTF? " "Oooh, what about the cinematography!?" - whoopee - they show a wheat field from afar in as many ways as possible? Yeah, I live near farmland, seen wheat fields in real life, I'm over it. How can so many people be describing these same repetitive shots of wheat as "the most beautiful movie ever!!! !1" - I'm guessing they all share the same brain or were brainwashed by some influential, self-righteous critic. This psycho Malick also included #AnimalCruelty by forcing a fox to run through flames - it'd clearly already been burnt too, so he'd obviously done more than one take. Sick, overrated director. Avoid! what i take away from CA's review is that CA obviously didn't get the movie. otherwise he/she might have seen it 10 or so times as i have, and found it more moving and ravishingly gorgeous in everyway, with each successive viewing. "days of heaven" is truly work of visual and aural art, one that, like a marvelous musical composition or a passionate love, grows more complex, more enthralling and more revealing with each experience of it. too bad CA. i didn't get the mona lisa either, until i saw it in person (before they put it behind glass).